Charles Alexander Hooper was born in 1869 at Eastington, near Stroud, Gloucestershire, the son of a woollen manufacturer, who had 450 employees working for him. Charles grew up at The Lodge, Summerhills, Eastington, until he was sent as a boarder to Clifton College, Bristol, where he represented the school at rugby and cricket, and became head boy. In 1888, he went on to university at Trinity College, Cambridge, and gained his blue for rugby when he played in the Varsity Match in 1890, which was postponed on three occasions because of fog, before it eventually ended in a draw, one goal each. Charles, along with several of his Cambridge teammates, was invited to join the newly-formed Barbarians, an elite team with no ground, clubhouse or subscription, for which membership was by invitation only. The Club was set up by William Percy Carpmael, who played for Cambridge University and Blackheath. Charles played in the first Barbarians match on 27th December 1890 at Friary Field, Hartlepool, where they beat Hartlepool Rovers 9-4. Charles went on to appear for the Barbarians on nine occasions. Although only appearing in one winning team, he scored four tries, including two in the win over Devonshire in April 1891.Charles also served on the Barbarians committee. On 14th March 1891, he was in the County team which travelled up to Lancashire for the semi-final of the County Championship, when it was reported that “Hooper was the star on the Gloucestershire side, and with more offensive work he would have been certain to score. His running was admirable, his tackling sound, and his all-round play entitled him to the distinction of being voted the best back on the field”, but Lancashire won 14-0. Gloucester were also keen to obtain his services, but he was available only when back home between terms or on visits, so his appearances for the Club proved to be few and far between. A week after the county semi-final, Charles made his debut for Gloucester on 21st March 1891 at Penarth, a game lost by two tries to one penalty, and the Citizen reported that “Hooper has played much better than he did on this occasion, his tackling once or twice being faulty. He, however, proved reliable on all occasions when immediate danger was at hand, and when he got a chance ran in his dashing, brilliant style”. This was the penultimate game of the season, and he also played for the first time on the Spa in the last game of the season on 30th March against the Royal Naval College, Dartmouth, tasting his first success with the Club in victory by two goals and a try to nil. The Citizen reported that he was “prominent with several grand runs” and “of the three-quarter backs there was little to choose between the two wing men, Hooper and Taylor, and though the former did not score he had hard lines, and the College backs had a warm time of it on several occasions”. It was noted that he had quickly formed a very useful partnership with Walter Jackson inside him at centre. In his end-of-season summary, WB said “C A Hooper, who has assisted the county, and has played in the last two city fixtures, is so well-known not only in Gloucester but in London, and in fact all over the country, that it goes without saying that if his services could be secured for the future they would be of immense advantage to the club, for that he is a player of the very first water is thoroughly well established”. However, Charles graduated with a BA degree from Cambridge University in the summer of 1891, and on leaving university joined Middlesex Wanderers, because he took up employment in the London area, and this further restricted his availability for Gloucester. 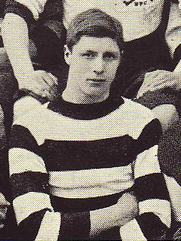 During the 1891-92 season, Charles was available for Gloucester for seven games. Although he missed the match which marked the opening of Kingsholm on 10th October, a week later he played at the Old Deer Park, Richmond, against London Scottish, when Walter Taylor was left out to make room for him, and scored the second Gloucester try (his first for the Club) in a victory by three goals to one. 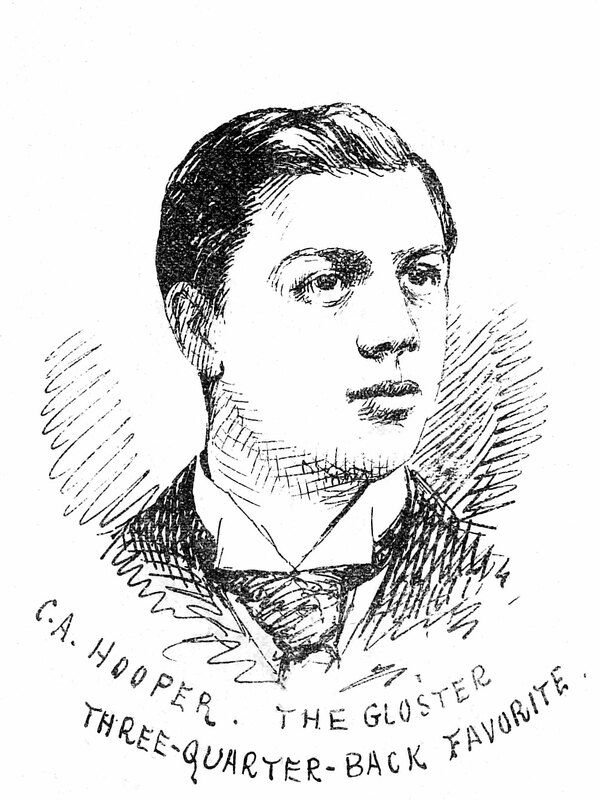 On 28th November, “C A Hooper specially journeyed from London to assist the home team”, for the match at Kingsholm against Newport, but it was lost by a try to nil, and on 10th February he again joined the team at an away venue, when a scoreless draw was played out in the Club’s first fixture against Oxford University. Charles was not available to play for Gloucester at all in 1892-93, but was back home for Christmas 1893, and turned out at Coventry on 23rd December, when he scored the only try in a game won 5-0, and against Old Merchant Taylors at Kingsholm on Boxing Day, a game which was lost 0-11. Despite these occasional appearances for Gloucester, the authorities regarded him principally as a Middlesex Wanderers player, and this was listed as his club affiliation when he won three England caps in 1894. That season, England decided to emulate the Welsh tactic and switched from three three-quarter players to four three-quarter players, and Hooper came into the three-quarters at centre. The first match of the tournament was against Wales, and England won 24-3, with Charles making a mark during the game, from which Ernest Taylor kicked a goal. His second cap came against Ireland at Blackheath, and England were ahead close to the end of the match, when Charles was caught in possession in front of his own posts, the ball ran loose, and Forrest kicked a dropped goal to win the game for Ireland. Nevertheless, Charles retained his place for the third and final international of the season against Scotland when the England captain, Lockwood, was unable to play, and Walter Jackson, who had just moved clubs from Gloucester to Halifax, was drafted in to play alongside Charles. The two of them may have gelled successfully when they had played together for Gloucester, but the partnership was less successful on the international stage. Scotland deservedly won the Calcutta Cup 6-0, and neither Hooper nor Jackson played again for England. The following season, Middlesex Wanderers folded, and Charles joined Richmond, but he returned for his final appearance for Gloucester on 13th April 1895 in a 3-12 loss to Penarth at Kingsholm. He finished his Gloucester career with twelve appearances and five tries spread across five years. By 1901, Charles was married to Frances, living in Kew, and working as a solicitor’s managing clerk. By 1911, he had moved to Hastings. In 1914, Charles emigrated to Hong Kong, where he practised as a solicitor. With the outbreak of World War I, he served in the Hong Kong Special Police Force. He returned to England later in his life, dying in 1950 at Gerrards Cross, Buckinghamshire.